hibernating after Rockport New Year's Eve. At Dock Square and along Main Street, La Provence, Lulu's Pantry, Sea Again, Christmas Dove, and Wicked Peacock are some of the wonderful independent shops. Walking on Mt. 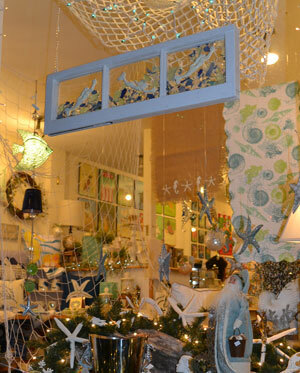 Pleasant St., you see Katie's Gift Shop, Sand Castles, and breakfast and lunch restaurant, Red Skiff. The famous Motif #1 is visible from downtown, usually adorned with a Christmas wreath. It is best to arrive early if you can. Parking can be difficult during event days like the Christmas Pageant. Visitors park on the streets. Year round public restrooms are nearby off of Mt. Pleasant St. on T-Wharf. 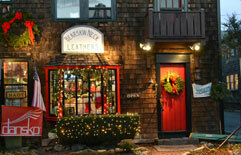 Downtown Rockport's Bearskin Neck shopping district is fun in the December days leading up to the holidays as well as in the peak season summer months. Bearskin Neck is a spit of land protruding into Rockport Harbor that contains more small shops, galleries and tasty streets. 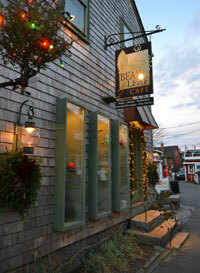 Bean & Leaf Cafe on Bearskin Neck has hot beverages, pastries, wraps, soups and salads with a small seating area on an enclosed back porch with gorgeous views of Rockport Harbor. 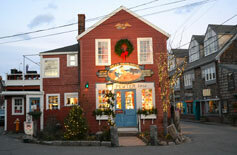 You can get the snack you need to continue your harborside stroll through the cottage filled streets. Helmut Strudel, Rockport Fudgery and Rockin' Cupcakes are other dessert options. 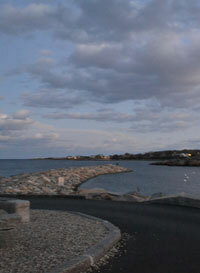 Take a walk to the end of Bearskin Neck for expansive ocean views punctuated by a long stone jetty. 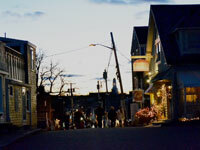 Other shops on Bearskin Neck that stay open for the festivities include the Pewter Shop, Carol Lee's Cottage, Earth's Treasures, Good Dog Gallery, Bearskin Neck Leathers, One Ocean One Love Shop, Rockport Candle Co., Floating Lotus, Shore Thing, The Last Resort, Art Nook Gallery, and Lauri Kaihlanen Gallery. Back at Dock Square, Tuck's Candy Factory does candy making demonstrations on select days in December. Taste their delicious peppermint satins, candy canes and ribbon candy (Tuck's Candy is available online if you can't make it to town). Tuck's Candy and Gifts shop is further up on Main St. and has candy and chocolates as well as small gifts and toys. 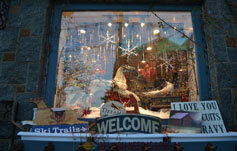 Traveling uphill on Main Street, several shops to visit are John Tarr Store, Tuscan Designs, and Paper Mermaid. Brothers Brew Coffee Shop has hot drinks to warm you up as you wait along Main St. to watch the Christmas Pageant if you brave the cold to attend this annual Rockport ritual. At the First Congregational Church, a large manger is populated with farm animals for children to visit before and after the procession. People crowd the top of Main St. and this lovely New England scene takes on a special glow as the stars, moon and village shops light Main Street. Chilly temps are the norm for this 60 minute outdoor activity. Coffee shops and stores can offer a chance to warm-up. The procession stops at the Rockport Art Association which represents the inn of the Bible story. Joseph and Mary are turned away then continue to the manger at the Congregational Church. Hymns are led by a choir. 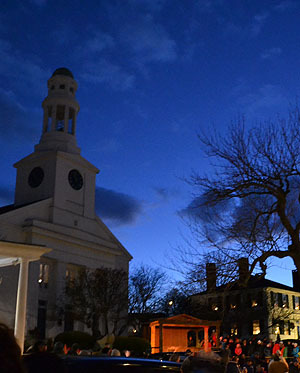 Afterward, the First Congregational Church serves up a ham and baked beans dinner (tickets to the dinner are $9.00 for adults , $6.00 for children 12 and under). 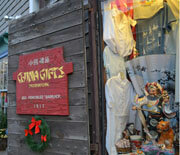 Many shops stay open late to accommodate visitors. Most restaurants are closed for the season, but some will be open during December and even year round. Call ahead to check, but possibilities include Roy Moore's Fish Shack, Blue Lobster Grille, Feather and Wedge, and Rockport House of Pizza. Take a 20 minute drive to the next town, Gloucester and you will find a fishing port that has many year round restaurants with hearty seafood meals, chowder and varied menus, like Seaport Grille (waterview), Latitude 43, Franklin Cafe, Duckworth's Bistrot, Causeway Restaurant (seafood, and Italian), Tonno (Italian), Destino's Subs, Azorean Restaurant (Portuguese and Azorean), Passports, Charlie's Place, Cape Ann Brewing Co. (pub, dining room, tours, events) and Short & Main (wood-fired pizza and shellfish). 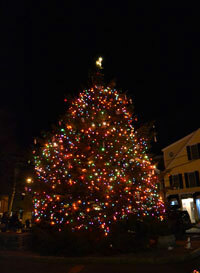 Also, many B&B's and inns in Rockport are open in December, and for Rockport New Year's Eve. These include: Seven South Street Inn, Tuck Inn B&B, Yankee Clipper Inn, Emerson Inn, Seafarer Inn, Eagle House Motel, Lantana House B&B, Linden Tree Inn, Periwinkle Cottage, Rockport Inn & Suites and Sally Webster Inn. And don't forget about New Years once the Christmas tree starts to wilt and the stockings are put away. Rockport hosts an array of New Years celebrations for those seeking to avoid the city yet still celebrate the New Year with lots of fanfare. Rockport events include many live music options, storytelling, puppet shows, fortune telling, and magic. Event buttons are needed for admittance to the indoor events. There is a children's drum parade along with a dancing dragon through downtown. The evening begins at 6 p.m. and culminates at midnight in Dock Square with Rockport's own ball drop and an Auld Lang Syne sing-along. Rockport hosts this event each year with about 15 venues all within walking distance of downtown. There is a free bus ride through the streets of Rockport as well. Free parking is available at Whistlestop Mall and a free bus takes you from here and the train station to downtown Rockport. 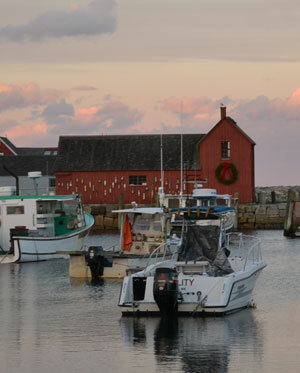 Rockport is a beautiful town that charms in the cold days of December with its wonderfully decorated shops and holiday decked out colonials. December is lively with community events and celebrations. You can find that special Christmas gift, browse the shop windows and breathe in the cold ocean air before you snuggle in for the winter. Events and Festivals - Lots going on for Christmas!